While Dubai is a byword for excess, vulgarity and human rights abuses, the UAE’s capital affects a higher calling. So, alongside the Emirates Palace Hotel (1,022 crystal chandeliers), the Grand Mosque (capacity: 40,000) and four million foreign workers, there are galleries, museums, seats of learning – and the stated aim of being a ‘role model’ for its neighbours. Has Abu Dhabi found a way to blend petrodollars with principles? 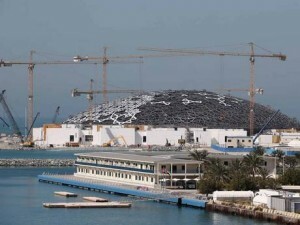 The Abu Dhabi Louvre looks like the top of a giant, primordial eggshell pushing its way out of the sand. 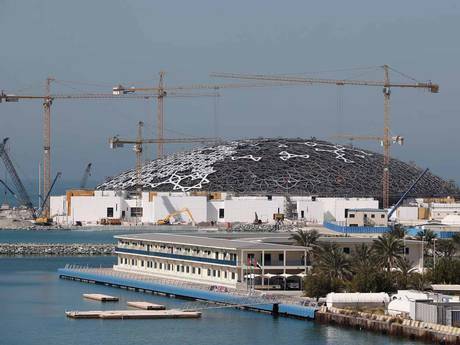 Its giant dome already glisters under the sun, its construction workers moving like spiders over five layers of cladding, steel and aluminium which will give this extraordinary museum a combined weight of 7,000 tons, just a little less than the Eiffel Tower. Already the concrete base of a man-made lake spreads around the construction, for architect Jean Nouvel’s Louvre will be on a miniature island, its works of art transported to its gallery through an underground tunnel, light sprinkled into its interior as if through the fronds of palm trees. Very romantic. Very French orientalist, I say to myself. Very Arab too, perhaps. The idea is that art will move chronologically through centuries inside the new Louvre, oriental and Western paintings next to each other. But won’t Abu Dhabi have a few problems with nudes, with Gauguin or Picasso or Poussin? No, says my companion, as he explains the double insulation and the cladding which will, we all hope, prevent water spewing on to the Louvre’s greatest masterpieces. “All that is accepted. This is art. This is for education.” Contemporary art will be inside the Abu Dhabi Guggenheim a few hundred yards away, still just a sand-pile of dumper trucks and bobbing labourers’ hats. “All that is accepted”? Unless, I say, Isis, known for its nefarious interest in artefacts, takes exception to the new Louvre’s educational purpose and tries to blast the water through the walls. The expert in cladding and concrete glances at me rather grimly from the wheel of his four-by-four and agrees quietly that “security” will have to be an element of all this. Maybe that’s why so many people in Abu Dhabi don’t like their names being revealed – my companion included – for they live under a form of autocracy; not the dictatorship of Saddamite or Mubarakite or Ghaddafite political power, but the dictatorship of money. Abu Dhabi is so rich, and its ambitions so mystical, that people speak in whispers. If the Abu Dhabi Louvre has already purchased Gauguin’s Breton Boys Wrestling – we shall find out what the Emiratis think of the amount of flesh exposed there – and Magritte’s The Subjugated Reader (a distinctly unveiled female reader, I should add) then perhaps some miracle has taken place. But if all this is educational, what to make of the Sheikh Zayed Grand Mosque? The truly gigantic carpet, the chandeliers, the fact that it was constructed by men and materials from Morocco to China and can hold more than 40,000 faithful – all give it the feel of cathedrals built in the Middle Ages. It has avoided the gruesome, concrete pseudo-modernism of the Saudi-built mosques of Bosnia, but is it art? Or, with its gold and precious stones, is it a message about the power of wealth as well as the power of God? The Prophet Mohamed was a businessman and he would, I suspect, have rather liked Abu Dhabi – but Mohamed was also a humble man. Is this mosque humble? That’s the catch in Abu Dhabi. When you own nine per cent of the world’s oil and close to five per cent of the planet’s natural gas, you have to decide whether you shout about it, display it before all with Saudi abandon, or send it off to fund charitable projects or cult-like Islamist militias. Abu Dhabi has stuck to charity, avoided the darkness of Wahabism, the gloomy puritan version of Sunni Islam fatally adopted by the House of Saud in the 18th century, but can’t shake off the need for ostentation. 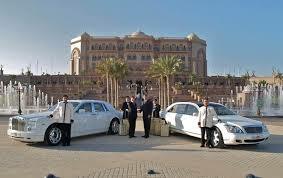 And the Emirates Palace Hotel is an obscenity. I’ve stayed there twice (not at The Independent’s expense) and I’ve written of its imperial architecture – Mogul-Gothic Lutyens, I suppose, with just a hint of Saddam and just a dangerous flavour of Titanic. This is egregious affluence on an unprecedented scale, real gold on the walls, doors and fittings, 1,022 crystal chandeliers and a guest list of Hollywood-Bollywood glamerati who’ve taken rooms at up to £10,000 a night. So gargantuan is the wretched hotel’s size that no guest can escape walking two miles a day; the Egyptian and Russian staff call it the “Hotel Sporto” because most have to walk between 10 and 15 miles a day escorting guests. Abu Dhabi is the sensible, adult version of Dubai, the capital of the United Arab Emirates, smaller than its neighbour, but probably the wealthiest city in the world. It’s still ruled by the al-Nahyan family whose Bani Yas tribe migrated to the north Arabian peninsula Gulf coast, opposite what is now Iran, in the late 18th century. So rich is Abu Dhabi, with an oil producing capacity of 2.3 million barrels a day, that even its total investments – statistics it prefers to keep secret – must be calculated to the nearest £70bn. The total figure is probably close to £650bn. Mr Nusseibeh sits on a Rhodes Scholarship committee and says how rewarding it is to see two young UAE students competing with international students, to see them go to Oxford to get their Masters. So Abu Dhabi and the other emirates must have good universities, he says, fine schools, a commitment to “education and culture”. Investing in the future, every Abu Dhabi government official will tell you, is also about renewable energy, solar energy, but it’s primarily about education. It’s not long ago that the West told the Arabs that Turkey should be their role model – until Recep Tayyip Erdogan started going bonkers, talking about plots and locking up journalists and turning into a role model for the Mubaraks and Ghaddafis that had already passed into history. Yet it’s not difficult to see what Abu Dhabi is trying to do. If Saudi Arabia is the empire of prayer and Qatar the empire of television – and Egypt the empire of far too many people – then Abu Dhabi runs the empire of higher education, the one commodity which has always failed the Arabs, or which the Arabs have always failed to take advantage of. And if Isis is a cult of lost souls, which it is, then what Abu Dhabi says it believes in is the antithesis of the “Islamic State”, and its crown prince’s plans to form a new non-violent front line against Isis. It’s tempting, indeed, to wonder if “the Arab world”, that singularly inappropriate phrase which we Westerners invented along with “the Middle East”, any longer has meaning. Perhaps we should re-imagine this region in three parts: the Maghreb and Egypt, the Levant and the Arab peninsula. Of course, we would have to snap off Yemen, lest we suggest that the Arab Gulf states can all crash into the same valley of death as that country has. But in this narrative, education, the life-saver, surely, of our imagined Arab world, streams from those wealthy jewels along the Arabian gulf. Qatar too, and Kuwait, despite its corruption. From education comes dignity and from dignity comes justice. But this is surely too sentimental. It’s glorious to know that in Abu Dhabi there is an Abu Dhabi Choral Group, an Abu Dhabi Music and Arts Foundation, an Amadeus Music Institute, a House of Oud, studying the Arabic stringed instrument which is a distant relative of the lute, the International Music Institute and the Modern Art Music Institute. But then I find Abu Dhabi’s version of Time Out lists 108 bars and nightclubs in its entertainment inventory. Is it trying to imitate Dubai? Can there be two Dubais – or two Abu Dhabis – in the Emirates?